Last month I posted to this blog with some photos of the wonderful handmade finds I came home with from the Boston Handmade Somerville Marketplace. Since that post I realized that our home is really full of handmade love, largely created by members of Boston Handmade. It makes me smile every time I see and utilize the handmade items we have here, and I wanted to share more of this joy with you through pictures. All the items shown in this post can be found in my son's room. 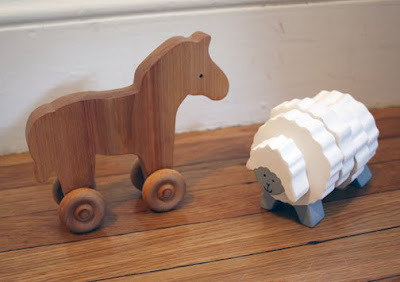 Above are two wooden toys made by Colleen of Tactile Baby. Zachary loves these toys, especially the wheels on the horsey. 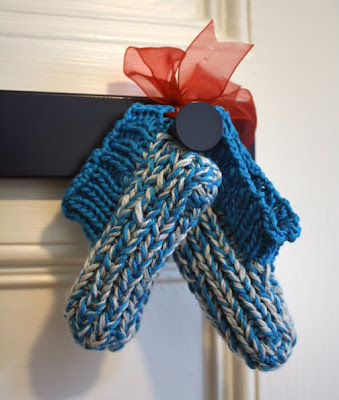 These really sweet booties were a newborn gift for Zachary made by Jen of Blue Alvarez. I love them so much, and the ribbon they are tied together with, that I keep them hanging as decoration even now that Zach's feet have grown too big to wear them. These two delightful pieces of artwork were made by Amy of Bumble Belly Designs. 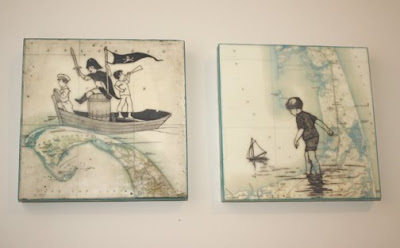 They were the first pieces of art that I purchased for Zachary's room and I just love these playful little boys with their boats. I look forward to the 'someday' when Zach wants to dress up like a pirate. 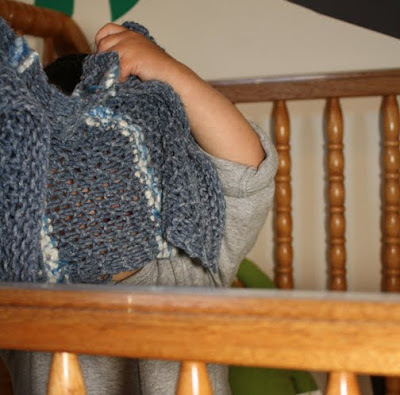 This last picture shows the small blankie that I knitted for Zachary. He cuddles with it, sleeps with it, and plays peek-a-boo with it, which is what he's doing in this photo. Some of the yarn knitted into blankie was made by Diane of Lady Dye. I've made lots of things for Zach in the past year, and I've made many items around our home like curtains, throw pillows, and ceramic bowls. I love knowing that so much of our home was created by my own hands and by the hands of artists and artisans that I know personally, and with Zach's first birthday coming up we've also found some handmade gifts for him that I'll share after the big day - so stay tuned! I love the Bumble Belly art! Something about them (the sense of adventure, maybe?) reminds me of The Little Prince. well i really enjoy reading your blog. It is really nice one.I like all pictures specially that two paintings.Looking forward for more of the blog in near future.